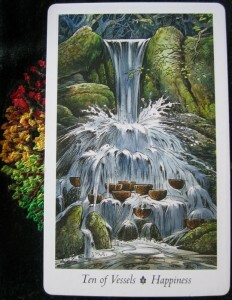 Today’s Card of the Day is the Ten of Vessels, with the keyword of “Happiness”. I have now Helen Shapiro’s song “Walking back to Happiness” going around in my head and it’s making me smile! Today, I have committed us to getting a rather gorgeous fluffy black cat. Now, whether the thought of a new addition to the family is making me happy or not, I do not know. What I do know is, the mice had better watch the heck out soon!! I bet he’ll be a fantastic little hunter! 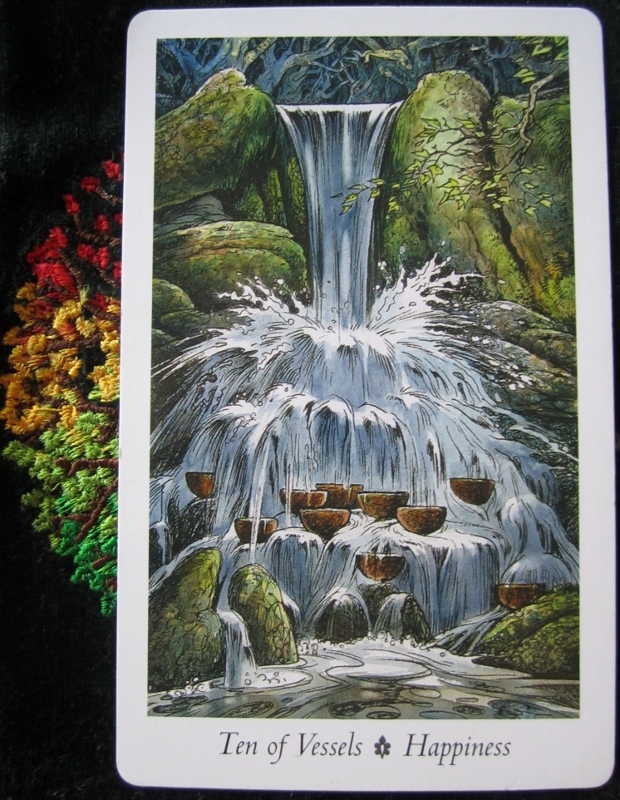 But on a more meaningful note today, what can this card tell us? It can advise us to be emotionally happy with what we have: having too much and it overflows. Always wanting more can lead to dissatisfaction when we don’t get it. But, do we need what we are wanting? I have been busy with Tarot readings today (get yours here). Three months ago, or even five weeks ago, I didn’t contemplate having a cat in the house. However, the mice have driven me to distraction (it’s hard to do readings when you see them running around out of the corner of your eye) and I am fed up of them being in the house, squeaking away like they owned the place. It’s MY house. Mice belong outside in nature, not in my house, poo-ing over everything. The poor dog was having her food raided right from the bag too! So, soon it’ll be a time period of stopping the cat and dog from fighting (hopefully, I won’t have to separate them too often! ), no more mice and eventually, come the Spring Equinox (not hoping to have a harmonious house by Imbolc) all should be well in my house: again! That I am looking forward to and that thought, makes me happy! In the mean time, I shall enjoy my Sandlewood candle from Busy Bee Candles in Wales downstairs, my Blue Bell Wood upstairs and even a soak in the bath for just me tonight. Oh, what a Lush idea!